My workday is always broken up, as are my nights. I sleep poorly, I'm anxious, depressed, almost always on edge. I fall asleep reading political theory, physics, Dorothy Wordsworth's journals most recently. I wake up in the middle of the night, nap during the day. I'll look at BBC news to keep up with things. If I can't go back to sleep, I'll get up, go in the other room so as not to wake Azure, get online and get work done. I've seen all sorts of specialists, there are times I'm up 3-4 times during the night with day's brain-fog ahead of me. I become ill at times because of this extreme insomnia. Most recently I've been getting up finally between 6-10:30 a.m. I go into the other room, as I said, Azure may still be asleep, it's morning. She sleeps better without me tossing and turning. I go online and begin writing. I can write well in the early morning. I have no smartphone but have gaming computers and a Lenovo X1 Carbon laptop that's extremely fast. All the computers are PC or Linux; the latter are excellent older machines and I can do a lot of work in the terminal. In fact my panix.com email address is also through terminal and lower ASCII; this allows me 1. 1. not to be distracted from advertising/images/etc. ; 2. to process a lot of information quickly; 3. to work in a relatively hacking-free environment; and 4. to work in an environment where scripting and perl programming (for examples) are right there at the prompt; I can process text or texts very quickly - for example grep allows me to search multiple texts and directories simultaneously for words or phrases, almost instantaneously. So I do this early. The rest of the day has multiple disruptions. To stay awake, I often have tv in the background - if possible soccer (European football) games in the background; my team, if there is one, is Barcelona, and the league I have on, La Liga. This keeps me going, I don't have to watch, it gives me energy. Azure and I live almost totally isolated; we have 2-3 friends here but the last time anyone invited us over for coffee, over for dinner, even out for coffee, was well over two years ago. We're social people, but we don't fit in, in Providence, and as a result I feel marooned here. So noise passes for community. We're still trying to get out. I should mention the noise here; there are bars downstairs, construction in the area, motorcycle and other groups revving engines, etc. ; we've had db readings up to 92, usually around 70-80+ when things get going. The sound is erratic; we have to use a noise machine and sometimes earplugs at night, and none of these work well. The result is even more fractured sleep, more upset. I've been going to doctors but haven't found a way to deal with any of this that works - pills make me either ill or groggy, mindfulness does some good, but sudden sounds (which happen all the time) interrupt everything. I'm concretely always stressed to the point where it's become a clinical depression. I take nothing, try everything else. I write morning, noon, night, late night, etc. My other fundamental activity is practicing music; I play a number of instruments, ranging from the Chinese guqin to parlor guitars, sazs, flute, shakuhachi, etc. The music is all improvised; for me it's technical. I work hardest on fretless and bowed instruments - my bowed instruments of choice are viola and sarangi. I record my practices and 'put up' the music online if it's good. There are also cds and lps released, as well as some tape cassettes; they get good reviews. At last count, something like19 to date. The days are chaotic for me; I'm usually exhausted most of the time. Azure will make breakfast, I'll forage earlier. I drink coffee during the day. I have no set schedule. I try to keep in touch with people through phone, email, etc. We'll have lunch, usually a salad, and dinner. They're at more standard times, but that's also variable. We eat something close to a mediterranean vegetarian diet. I worry about wrecking Azure's schedule. We walk about an hour a day if we can. We look at birds, usually in the evening, they're around We'll work together in a coffeeshop, usually Small Point, down the street here in Providence. I need to get out of the house daily; otherwise my depression's worse. And we travel a great deal. I really see my studio, where I want to work, where I think well, what I think of, as being within a world or void of Sturm und Drang, a world of elements where, for me, the somatic and the obdurate meet and intermix, where the world is entangled with itself. 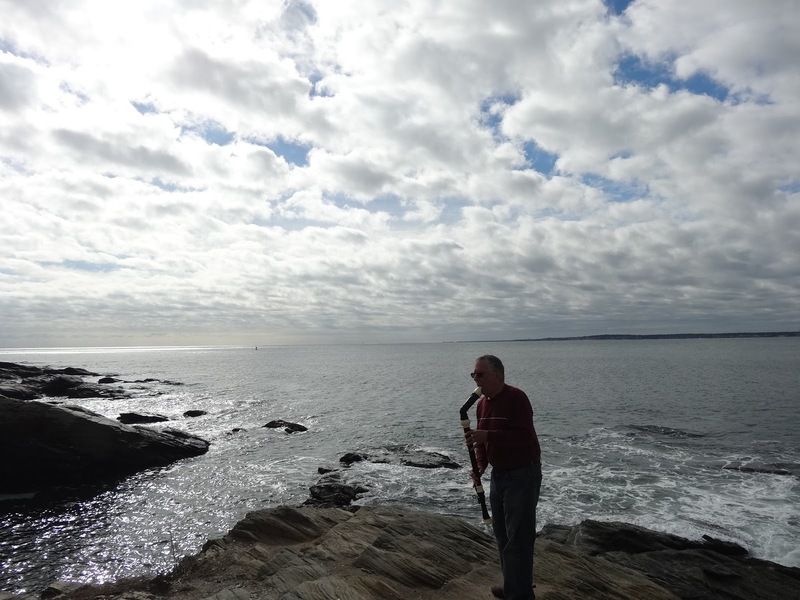 So I will play, usually a woodwind or something like a bosun's whistle, on the edge of a cliff, or in high wind, and this becomes a video and a kind of inspiring text of sorts. I go out in bad weather, I've been directly under a small tornado (in Brooklyn! ), in hurricanes, hailstorms and blizzards, etc., and these (non)events form part of my work. I tend to work in multi-media as well as many media simultaneously, moving for example from the Second Life, local OpenSim, and MacGrid virtual worlds, to Supercollider programs in combination with acoustic instruments, to codework and other forms of writing; when I have the chance (i.e. working with equipment at a place like Eyebeam in New York or at a university like WVU in Morgantown, West Virginia), I'll use technologies ranging from cave environments to (altered) motion capture equipment - I need to work on the 'edges' of technology, where errors appear, where new things are learned. When we hike, we look for fungi. We've found, we believe, several new species of insects as well. We leave things where they are, document htere; we're not collectors. The writing is most difficult for me; I want to write, in whatever form - poem, essay, codework, fiction, etc., about and within foundations, producing texts that, for me at least, have philosophical import. I'm not interested in poetry as poetry, but as something I can inhabit, and learn from, learn from the inhabiting. I read voraciously; every day I also go out and bring a book or two back. At the moment I have Southey's Thalaba the destroyer here, as well as Susskind & Frieman, Special Relativity and Classical Field Theory (I barely 'hold onto' the mathematics, but reading for as much of a general framework as I can get), Shirer's Berlin Diary, Isabelle Knockwood's Out of the Depths, The Experiences of Mi'kmaw Children at the Indian Residentail School at Shubenacadie, Nova Scotia; Alexander Reid Ross' Against the Fascist Creep, and Abjection, Melancholia, and Love, the Work of Julia Kristeva, edited by Fletcher and Benjamin. I read Science magazine and the New Yorker regularly. I have gmail and other email correspondence which I reply to daily. I post my work on several email lists, including two I began over 24 years ago with Michael Current, who died shortly after; I also post work on Facebook and YouTube. Part of the day is working to do talks or shows or visits elsewhere; we tend to travel a lot, which keeps me going; this year we've been in New York, Denver, London, Acadia (Maine), Atlanta, etc. ; we stay with friends (usually artists) or relatives (my brother, Azure's parents, sometimes Azure's aunt) as much as possible. I worry about growing old, when I won't be able to play music any more (I play quickly and complexly), when I won't be able to think 'properly,' however defined, etc. At that point I'm not sure I want to keep on living, so there's also this horizon in the back of my mind, which I picture as a thick, dark, and colorless curtain slowly descending. But there are also moments of great beauty and humor, and I feel deeply that I owe so much to Azure, without her, I'd be nowhere, lost, whether or not I was still making work. And I value the very few friends I have now, more than anything. When I try to fall asleep, one other thing, other than the mindfulness exercises, I think of mathematical objects, cubes or hypercubes or other forms, and try to picture complicated (for me) topologies related to them, most recently looking for all the paths across them one way or another. I also spent a year tyring to picture four-dimensional shapes by hammering away, mentally, on extrapolations from three dimensions, etc. I go through phases this way. Given that my work deals so much with the body, I'm awkward with my own; I used to do more sexual work, but haven't for years. I've also worked with dancers at times, most often with Foofwa d'Imobilite, who was lead (if there was one) with Merce Cunningham. I bring this up because I was able to think of the body, through his dancing, choreography, and company, as supple and intense in ways I couldn't imagine before. I think that he, and I, and Azure might have made something like 40-50 pieces together; I found what he could do absolutely amazing. That way of working still informs me; when I've used, for example, the Cave at Brown University, I had his choreography (among othe r things of course) in mind. So maybe all of this presents something of my everyday (broken) routine; I keep trying to impose structure, only to find my insomnia or world events or other things breaking it down, breaking me down. If I had my way, I'd be sleeping now, instead of writing this. 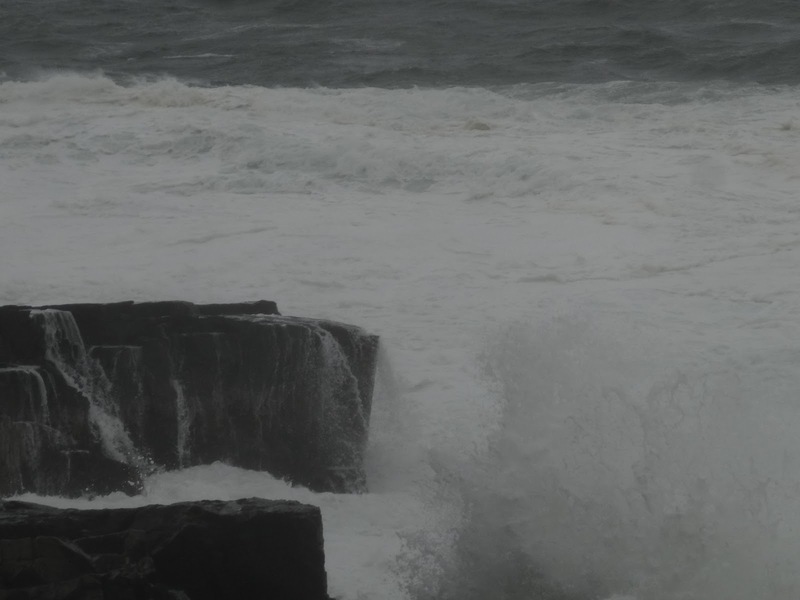 But at least I think about the tides, and what the two images accompanying this represent, what sorts of slow breathing the planet engenders, and I'll end now, hope this is of interest to you, and hoping for the best. Alan Sondheim is a city-based new media artist, musician, writer, and performer concerned with issues of virtuality, and the stake that the real world has in the virtual. He has worked with his partner Azure Carter among others. Sondheim is interested in examining the grounds of the virtual and how the body is inhabited. He performs in virtual, real, and cross-over worlds; his virtual work is known for its highly complex and mobile architectures. He has used altered motion-capture technology extensively for examining and creating new lexicons of behavior. His current work is centered around notions of gamespace, 'edgespace' (the border areas of gamespace) and 'blankness,' projections around edgespace. He's been developing a theory of semiotic splatter / splatter semiotics, dealing with fast-forward literatures of twitter, politics, 4chan, facebook, etc. His writing stems out of codework, a problematic style in which code substrates and surface content interfere with each other – in which, in other words, the textual body and body of text are deeply entangled. His current music is based on the impossibility of time reversal, on fast improvisation, and anti-gestural approaches to playing. His most recent work is this short biography.